When I was a kid, he would always buy badam halwa from MTR, Bangalore (MTR is famous for it's spices and ready to make packets).The halwa used to be very heavy and literally ghee used to drip from the packets. 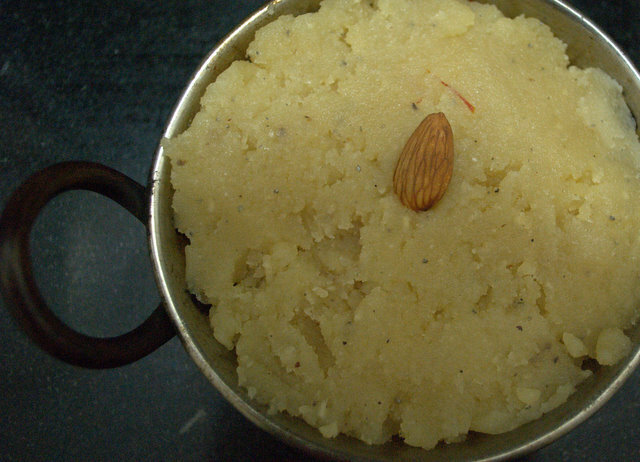 My mother would get atleast a tablespoon of ghee, each time she warmed the halwa. You could only taste ghee...and I didn't like it too much. MTR still makes the halwa and it's been ages since I've had it. I remember the halwa, not for it's ghee or sweetness; I remember it because my dad used to buy it for us with lots of love and enthusiasm. I followed every step of DK and the halwa just turned out perfect. I also sent some to my dad and he liked it too and requested me to use more ghee the next time I make badam halwa. A quick tip on how to remove the skin of almonds: Boil some water in a pot. Once the water is hot and bubbly, turn off the stove and add the almonds. Cover the top and let the almonds sit in the pot for about 15mins. After 15mins, wash the badam in cold running water and just slide the skin with your fingers.See how easy that was!!! This is my submission to this month's event Tried & Tasted, hosted by Priya from Priya's Easy N Tasty Recipes and Lakhsmi from Kitchen Chronicles. Woww lipsmacking badam halwa, simply delicious..thanks for sending to T&T..
Almond Halva, truly delicious and rich in taste.